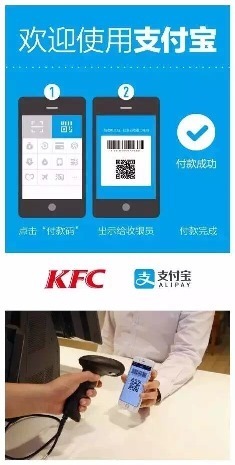 More than 700 KFC (Kentucky Fried Chicken) restaurants in Shanghai and Zhejiang Province have adopted Alipay’s mobile payment solution, and the service is set to expand to some 5,000 KFC outlets throughout China. Through the partnership, consumers are able to settle payments in local KFC restaurants by using the Alipay Wallet app on their smartphones. The cashless payment solution is expected to enhance operational efficiency of the popular Western fast-food chain in China. The tie-up with KFC is the first major move of the newly established Koubei, a 50-50 joint venture between Alibaba Group and its affiliate Ant Financial that focuses on increasing the availability of local services through O2O (online-to-offline) e-commerce. Koubei plans to integrate Alibaba’s existing food ordering and delivery service Taodiandian and Ant Financial’s merchant services. KFC, which has been operating in China since 1987, has been upgrading its restaurants for mobile commerce. Wi-Fi is now available in 2,200 KFC outlets across the country and the company launched a mobile application for food ordering in Shanghai and Hangzhou. According to iResearch, Alipay, a subsidiary of Ant Financial, accounted for 82 percent of China’s third-party mobile payment sector in 2014. In May, 25 Walmart supermarkets and hypermarkets in Shenzhen accepted Alipay’s mobile payments.